What is the best natural treatment for a fever? Can you bring a high temperature down with homeopathy? What are common mistakes to avoid when using homeopathy in fever? How will you know if the remedy is working? What’s the First Thing you do when Your Child develops a Fever? You get a phone call from school; your child is not feeling well. As soon as you pick them up you see they have a temperature. What’s the first thing you do? For many people, the automatic response is to give paracetamol “to bring the fever down”. If you haven’t already done so, you really need to read my previous post about the purpose of a fever. Remember: a fever is part of the body’s natural defense system; it has a very important role in helping the immune system to fight infection. Did you know that there are 3 stages to a fever? If you can understand what your immune system is trying to achieve at each stage, it will help you to manage both the fever and the illness. Be assured that a fever means your child’s immune response is working properly and that their body is fighting infection. There’s no need to panic. Observe your child calmly to see what they need. A fearful child needs company and reassurance. A chilly, shivering child needs warm blankets and a hot water bottle. A drowsy child needs to lie down and sleep. Offer drinks, either warm or cold, as they prefer. Even drinking a small amount is useful to avoid dehydration. Assess the seriousness of the situation: take your child’s temperature, notice what other symptoms are present. Once you have made your child comfortable, take time to see if you can identify the cause of the fever. Give time for a full symptom picture to emerge before contacting your homeopath, or, if self-prescribing, before choosing a remedy. If you rush to give a remedy that’s not a good match, it won’t resolve the illness but it may confuse the symptom picture, making the choice of remedy harder in the long run. By taking the time to choose a remedy that matches all of the symptoms, your prescription will be much more accurate and much more effective in resolving the illness and not just the fever. Once you have given a carefully chosen remedy, give it a chance to work. Sometimes the temperature will come down within minutes. Sometimes the temperature will stay up, but the child feels better, as pain and inflammation are reduced. It’s useful to pay more attention to the condition of the child than the number on the thermometer. Knowing the 3 Stages of Fever can help you to interpret the reaction to the remedy. Then you can judge if the fever has moved onto the next stage. What is the Best Homeopathic Remedy for Fever? Although Belladonna is the most well known homeopathic remedy for fever, there are many others. 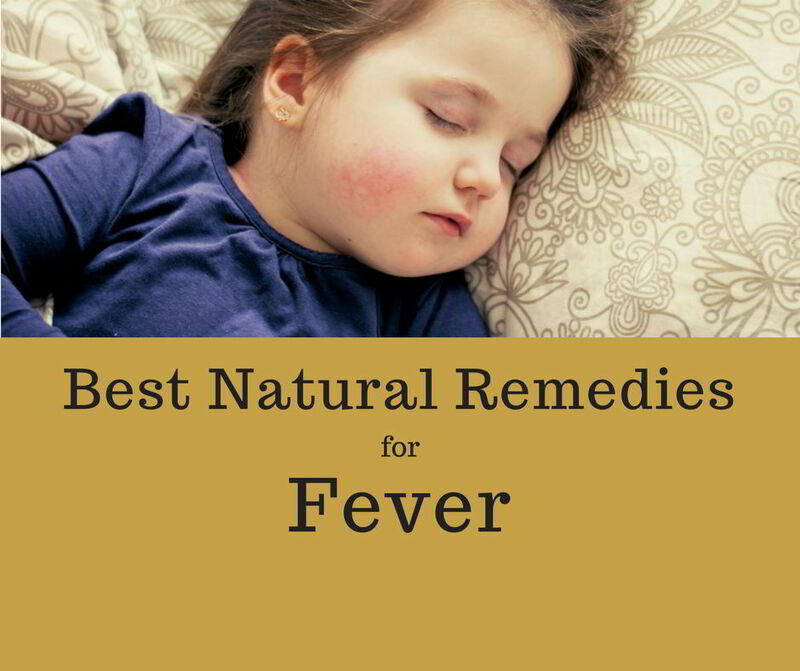 All of the above remedies are capable of treating a fever BUT they are not inter-changeable. Each remedy has its own set of symptoms. The best remedy for your particular fever is the one that matches your full symptom picture. Was it gradual or sudden? If it began suddenly, at what time? What was the lead-up: did it happen after too much sun or exposure to a cold wind or getting caught in the rain? How are they in themselves? Pettish and insisting on constant company? Tearful? Fearful? Irritable and contrary? Asking everyone to go away? Restless and unhappy? Very drowsy and “out of it”? Trembling and weak? Sensitive and shaky and wanting to be gently treated? Delerious? On the other hand, they might be sleeping peacefully or calmly watching TV from the comfort of a duvet on the sofa. As you can see, there are many ways a fever can present. What is your child’s temperature? How do they look? Pale? Bright red? Dark, purplish red? Sleepy, droopy eyes or shiny, bright eyes with enlarged pupils? Are they perspiring at all? If so, on what part of the body? Do they seem to be feeling chilly or warm in themselves? Do they prefer to be covered or not? What is the heat distribution like throughout their body? For example, have they a hot head but cold hands and feet? Perhaps one side of the body is warm while the other feels cold? Maybe their skin feels like it’s burning up to you but, internally, they feel cold and want to be covered. Are they thirsty or not? Do they prefer warm drinks or cold? Are they asking for anything in particular? As a full symptom picture emerges, the reason for the fever may become more obvious. Have they pain anywhere? Perhaps they have a sore throat, or an earache? The start of vomiting or diarrhoea may suggest it’s a tummy bug. Are they coughing? Is there any rash on the trunk or behind the ears to suggest it’s an infectious childhood disease such as chicken pox or scarlet fever? All additional symptoms should be included in the information your homeopath uses to prescribe the most suitable remedy. Sometimes the symptoms are very obvious, the choice of remedy is clear and the effect is like magic. Sometimes, things don’t go so well: you’re not sure if the remedy is the right one or you don’t know how often to repeat or how much improvement you should expect. If you’re planning to be a home prescriber, it’s a good idea to learn about it before an emergency arises. There are several homeopathy books aimed at parents, which deal with common conditions that arise in family life. You could also sign up for an online course given by a reputable experienced homeopath or attend one of the Home Prescriber’s courses that are offered by many homeopaths and schools of homeopathy. If you are currently attending a homeopath for constitutional treatment, it’s a good idea to engage their help when your child has an acute illness. For anyone who is working to resolve chronic health conditions, or the tendency to recurrent infections, an acute illness needs to be seen in the context of their case as a whole. The symptoms which are thrown up during an acute illness can provide important clues to assist your homeopath in the overall management of your child’s case. Aconite fevers have a sudden onset and become high very quickly. It’s a remedy for the early stage of an illness. Think of Aconite for fevers that come on after exposure to cold, dry wind or that suddenly develop around midnight. The face is flushed but, unlike Belladonna, the pupils are constricted. The Aconite patient is thirsty, restless, feels hot and kicks the covers off. They can be quite fearful – they may even say they’re afraid they’re going to die. Belladonna is another remedy with a sudden onset, often at 3am or 3pm. High fever, dry heat with a bright red face and glassy eyes and dilated pupils are the typical symptoms that point to Belladonna. There is little or no thirst but the patient may be tempted with lemonade. Although the body radiates heat, the hands and feet can be icy cold. All the senses are over-sensitive in Belladonna, so the patient will not want to be moved or touched and will feel worse for light and noise. Rigors and delirium can also be part of this remedy picture. Right-sided complaints such as right ear infection or right-sided tonsillitis can belong to the Belladonna picture. This is a great remedy for fever in a teething child. Their worst time is around 9pm and they scream, cry or moan with the fever. They are very sensitive to pain. There will be great irritability. They ask for things and then throw them away. They want to be carried but you need to keep moving. You may see one red cheek and one pale. The face can be hot while the rest of the body is normal temperature. Gelsemium is best known as a ‘flu remedy. The symptoms come on gradually. Weakness, heaviness, aching muscles, tired eyes and a heavy head are all symptoms associated with Gelsemium. The Gelsemium patient can feel so weak that they tremble. Chills and shivers are especially felt along the spine. The most notable symptom of a feverish child who needs Phosphorus is that they don’t look sick. The temperature can be moderate or quite high but they are still playing and eating as if they were well. There is no perspiration and they are thirsty for cold drinks. A Pulsatilla fever can be low or high but the most characteristic symptom is their changeable mood. They can be weepy, clingy, or irritable. They definitely want company, either sitting beside them or holding them close. Their temperature can also be changeable – one minute they feel hot and kick off the bedclothes, the next they feel chilly and want to be covered. They are typically not thirsty, and feel worse for hot stuffy rooms and better for fresh air. Their worst time is often around twilight. Dissolve 2 pills in a half glass of water. A dose is 2 teaspoonsful. As with all homeopathic remedies, give at least 10 minutes away from food or drink. Stir the mixture well before each dose and keep the glass covered between doses. The basic principle is to give a dose and watch for improvement. When improvement wears off, repeat the dose. Typically, you might give the first 2 doses half an hour apart and the third dose an hour after the second. As the patient improves, the interval between doses becomes longer. If symptoms are intense, you might give up to 6 doses on the first day. Depending on the illness, one day might be sufficient or you might continue to give the remedy 2 or 3 times a day for a few more days. In some cases, a change of remedy might be needed if the symptoms change but the patient is not fully better. What Improvement Can You Expect when Using Homeopathic Remedies in Fever? When you know the signs, you can often see your child moving from one stage of fever to the next. Sometimes, progress through the stages can be rapid. Pain and inflammation is reduced. A fractious child becomes calmer. A restless child wants to sleep or a drowsy child starts to become livelier. The appetite starts to come back. The fever comes down. The child is more content. It may take another few days for the illness to be fully resolved but you can see that the child is more comfortable and better in himself. The process of recovery is set in motion. When you gain experience in using homeopathy, you’ll find that a well-matching remedy can work very quickly in acute illness. As a general guideline, if you are not seeing some improvement in your patient’s condition after the third dose of a remedy, it’s time to reassess the case and find a better matching remedy. Do not keep on giving a remedy that’s not helping. Be aware that your first aid remedy kit does not contain all the homeopathic remedies that are available. As a home prescriber, you will only have access to a selection of the most common remedies. You may not have the resources to treat every condition yourself. Always be guided by common sense. While most children’s illnesses are benign, every parent has a concern that they could miss the early signs of a serious illness. It can be reassuring to have your child medically checked, if you are unsure about the cause or severity of their illness. Recurrent infections such as upper respiratory tract infections, recurrent tonsillitis, otitis media and frequent coughs and colds are all good reasons to consider bringing your child for a course of homeopathy. We usually begin with a constitutional homeopathic remedy, which is given to improve their overall health and boost their resistance to infection. Read more here about the natural treatment of children’s recurrent infections.